I had heard that this was such a great, fantastic, unique, enter-adjective-here book so when I was offered a trade for it, I jumped all over it. But when I started reading it, I started and stopped A LOT and found it really hard to get into. And then I was just neutral about it overall. I didn't love or hate this one and found that it probably would have been better with a few adjustments. The best part about this was how political it was, but the politics weren't seriously explained and left me wanting either more screen time for the politics or more of an explanation of how the politics actually worked. It was pseudo-Westminster style politics but it was never truly given more thought than that which made me really sad. We got brief glimpses of how things worked but never enough to really satisfy me or allow me to feel submersed in the world. On top of that, there were way too many narrators. I usually love a lot of narrators but only if there is a point to all the narrators and that just wasn't the case here at all. I felt as though I couldn't understand the wants or desires of the characters because we were never given enough time with any of them for me to really connect with them or understand them. This is especially true for the relationship between Abi and Jenner. It was so out of left field that I was mostly just confused rather than grossed out (because SUPER NOT A FAN OF SLAVE-MASTER RELATIONSHIPS). Other peeves: never quite sure how much time had passed but then it would be months later and I would be left scratching my head. It was just really confusing. There was also some aspects of the world and world building that were never quite explained but we were supposed to just accept as okay, like A MAN THAT IS SUPPOSED TO ACT LIKE A DOG. Which ???? And then when we learned his backstory I wanted to throw the book across the room. To me, this just wasn't anything special. It felt like a mash up of a lot of other really great fantasy novels but not nearly as good as those. I will probably wait for the sequel to come out and see other people's reviews to determine if I want to read it. 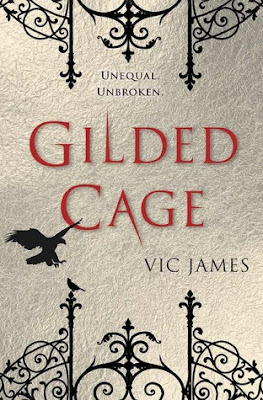 See Vic James discussing GILDED CAGE here! The romance storyline was definitely my least favorite part of the book. I wish it was cut out & I normally always want romance but it felt forced and I didn't really like it. Sorry it was just meh for you but at least you didn't hate it LOL. Haha. Awww that sounds really confusing and frustrating... I'm still curious though haha. Hopefully the sequel will be better! I tried reading this, as I got an ARC from SDCC last year but kinda glad it was free as I wasn't really feeling it. oh well.